A capacious single storey plantation-style villa with mountain views set on a sprawling 3500m² landscaped stand in a secure lifestyle estate on the temperate west coast of the island. 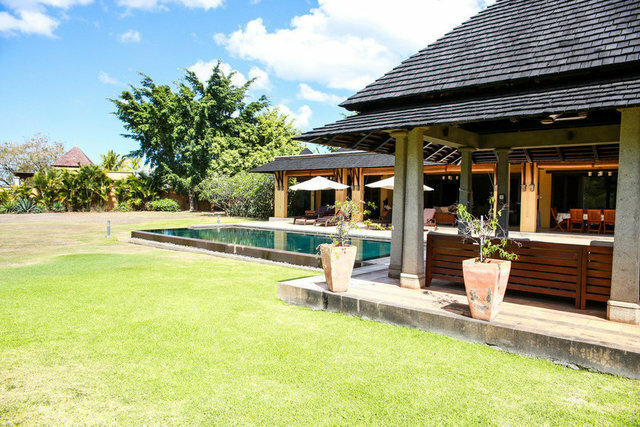 The expansive, high ceilinged open plan living area leads out to a generous outdoor entertainment area that includes a covered terrace, sizeable rim flow pool, gazebo and wooden sundowner deck under the African thorn trees in the garden. A generous fully-equipped traditional kitchen is perfect for catering for friends and family. All four bright and airy bedrooms are airconditioned, two of which are master suites with walk-in wardrobes and sliding doors which open out to the lush garden. Ready to move into, it is fully furnished and equipped with everything need for a luxury island lifestyle, including stylish outdoor furniture. A double garage provides secure parking. Residents enjoy access to all the estates facilities, including the Tamarina golf club and restaurant, tennis courts, and the beach club and restaurant. A host of amenities from banking to shopping centres are within a 2km radius and the area also boasts a choice of outdoor activities.